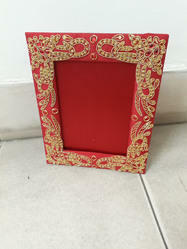 Photo Frames are made of MDF & painted by hand. We provide these Picture Frames in various designs & sizes. We provide these Photo Frames keeping in mind the best quality. 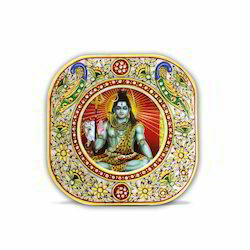 All Kind of Handicrafts and Decor Items Manufacture Company. For Example #Handicrafts , #Decor , #Temple , #Mandir , #Poojaghar, #Keyholder , #WallDecor , #Frames , #Tapestry , #Clock , #TrendingDesignHandicrafts. The wide assortment of Painted Photo Frames offered by us also includes jewel photo frames. These are available in different colors and in sizes including 4x6 insert. The frame is fabricated with quality range of sparkling jewelries and is best to preserve the memories of your loved ones. This elephant shaped photoframe is a must to accentuate the beauty of your table. - The photoframe has been handcrafted in bright blue and orange colour. - The photoframe has been fixed on elephant's body. 2. Suitable for passport size photograph. This camel shaped Photo Frame is a must to accentuate the beauty of your Table. The Photo Frame has been hand painted beautifully. - Photo Size: 5 x 7"